The railroad station at Switzerland's Jungfraujoch is the highest in Europe, and it's likely that the nearby Eispalast is the highest-altitude ice palace in the world. 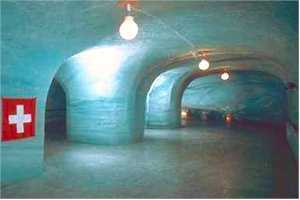 The Jungfraujoch ice palace is also longer-lasting than most, being hewn from Europe's longest glacier. Although the Jungfraubahn has been hauling passengers up to the Jungfraujoch for more than 85 years, the ice palace wasn't begun until an artistically inclined mountain guide started hacking at the Aletsch Glacier's innards in 1934. You might ask why an artificial tourist attraction needed to be built within a few steps of Switzerland's most celebrated mountain landscape. Good question. Maybe the ice palace was built simply to give the tourists something to look at when the viewing platform was fogged in. Our illustrated article tells how to reach the Jungfraujoch by train and how to save money on the fare. It also has links to Web sites for cheaper mountain-railway and cablecar excursions in the vicinity. Ice can be tricky to photograph, so read these suggestions in an archived message thread at Photo.net.